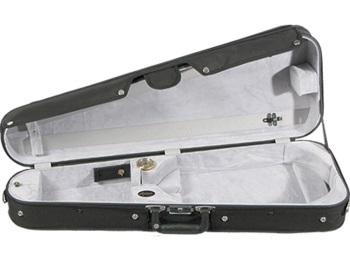 The new lighter arrow shaped adjustable viola case offers the same benefits of the adjustable B2005 with the option of using the patented adjustable slide to fit any size from 15" to 16.5" but weighs only 8lbs. A big case for less weight. Built using a layered plywood case construction and newly redesigned to maximize the arrow styled case shape, the B2028 adjustable viola case is covered with a durable black nylon canvas zippered cover and outside music pocket. Includes shoulder strap (does not include instrument blanket).